This morning we hiked to Chimi Lhakhang,the Temple of the Divine Madman. Lama Drukpa Kinley was a spiritual master who had a unique method of teaching to the people. He believed that the monastic body was too strict, therefore separating the common people from Buddhism. His goal was to loosen people up to bring them closer to Buddha. He was very much into wine, women and song. He is the one responsible for the phallic symbols seen painted on the sides of buildings all over Bhutan. Much of the hike was through rice paddies, which I unexpectedly thought were beautiful. We got to see the rice being harvested. When we got to the temple, I rested a bit while Stephen took pictures. Then we headed inside. At each of the temples we visited, if you made a small donation, they would pour some holy water in your hand to drink. It might have been more like oil – I’m not sure. It has special herbal ingredients in it. Usually after the holy water, you are done. But at this temple, they also bless you. The monk handling the holy water and the blessing was about eight years old I would guess. When you are blessed, you bow so that you may be touched on the head with the holy objects. In this case, the holy objects were an archer’s bow and a large wooden phallus. It was kind of disconcerting to see this little kid approaching with this phallus, but that is just an American cultural difference. It is a honor to receive a blessing, and I treated it as such. Pema said that kids usually enter the monastery between the ages of five and seven. It used to be compulsory for families to send at least one son, but that is no longer the case. Now it is the family’s choice and most choose not to send a child to join the monastic body. Pema calls the youngest monks the “mini monks” which I loved. It is hard to imagine having a family and being sent to be raised as monk nearly your entire life. They seem so young to be living the monastic life. 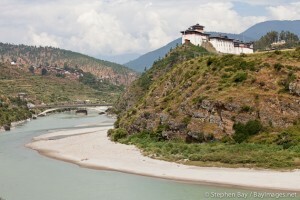 Wangdue Dzong and Punak Tsang Chhu River, Bhutan. Next, we visited the Wangdue Dzong. Unlike Punakha, the Wangdue dzong has not been restored, although I think they are beginning restoration work. 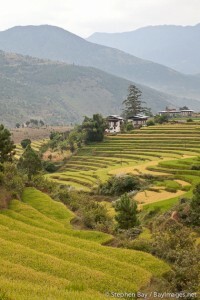 The layout is very similar to that of Punakha, although it is not as big. After visiting the dzong, we ate lunch, then had a chance to wander around the town a bit. I was looking for a baseball cap for my brother because I bring him a cap from every place we visit, but all the caps for sale in the town had logos like Reebok and Adiddas. When looking in one store, the daughter of the owner wanted to talk to us and ask us questions. Her English was quite good, and she was obviously very bright. I’d guess she was about eight or nine years old. She was fascinated by my watch because it has two faces. I told her “one for home and one for here”. Honestly, it is the most wonderful watch for travel. As we walked back down toward the car, two Indian guys walked up to us and very much wanted to speak with us in English. They were holding hands, which is not unusual in Bhutan, although I don’t know about India. These gentlemen were Hindu. We chatted a bit about where we were from and they wanted to know what sights we would be visiting. Interestingly, one of them asked us if this was the first time we had visited India. India has been a strong partner to Bhutan, but I found it very interesting that he either misspoke or considers Bhutan as part of India. Bhutan is very much an independent country. After wandering around in Wangdue a bit, we drove to Phobjikha Valley. 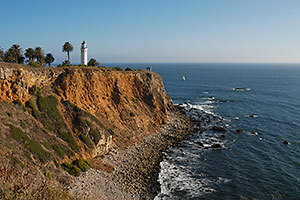 Amazingly, I didn’t get the least bit motion sick, because it was a windy, bumpy, two and a half hour drive. We stayed at the Gakiling Guest House. Our room was quite sparse and had a wood stove in the middle. We were told it would be quite cold in our room at night and that they would also give us hot water bottles for our beds. We took a quick walk down to the Crane Information Center, but we found that the Black-Necked Cranes had not yet returned to Phobjikha for the winter. At dinner, we met three French ladies and sat with them for dinner. I could really tell I hadn’t had a French class in 14 years. I caught a little of what they were saying, but one of them spoke English, so she translated for everyone. We had a great conversation, and some tasty tofu curry, then headed to our room. With our stove, water bottles and blankets, we actually got a little too warm. The pillows were not great (Stephen’s was hard as rock and mine was flat), so it was hard to sleep, but we did manage to get a pretty good night’s sleep.